Around 1890, a small school opened in Irvington on the property of the old Methodist Church. It had two front doors: one for boys, one for girls. Today that small school has graduated into what: Europe's Tatler-Cunard Travel Guide rates as one of the "101 Best Hotels in the World"; Travel + Leisure names it as one of this country's "30 Great Inns", American Historic Inns ranks it as one of the "Top Ten Most Romantic Inns", and Frommer's Travel Guide awards with Three Stars - its highest rating - 2003 Edition. Southern Living call Hope and Glory "fantastic". National Geographic Traveler (January/February 2003) describes it as "a top flight country inn ...flush with a playful elegance equal parts Martha Stewart and Grandma's attic". Coastal Living Magazine calls it "whimsical, extravagantly romantic... and guaranteed to make you smile". Couples escape. Families unite. Brides and grooms tie the knot here and remember year after year. 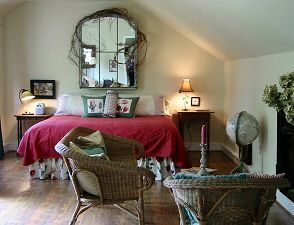 Seven individually styled rooms in a historic schoolhouse eclectically styled and hopelessly romantic, also with six quaint English cottages and lush grounds featuring flowers rarely seen in Virginia gardens today. Follow winding paths through authentic Victorian gardens, complete with a moon garden, which only blooms in the evening, and an outdoor shower (circa 1940) with a claw foot tub and sick in a totally private setting. Sweet strains of music continuously drift softly throughout the hotel and out over the grounds to the paths and gardens. All situated in a Chesapeake Bay waterfront village full of chic shops and 673 endearing people. 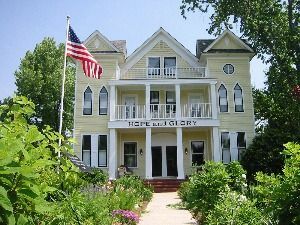 Beyond the gardens, there is The Meeting House, a small retreat and conference center, which offers today's technology in a creative environment that only can be found at The Hope and Glory. Cruise or sail onto the water with one of our own private Captains aboard our authentic Chesapeake Bay "dead rise", the Faded Glory. Our 1935 vessel graced the front cover of Chesapeake Bay Magazine last year. Participate in our Eco-Tours and our Crab Feasts aboard our authentic Chesapeake Bay "dead rise", the Faded Glory. Dine in style at Trick Dog Café, our truly sensational and hip sister restaurant described by the New York Post as "hands down the best" in the area "and perhaps the entire state". The Washington Times says "it deserves a Michelin Star". Soothe one's senses and be pampered nearby at a full service spa or hone your golfing skills on three classic courses, all within a complimentary bike ride. There is no better place to be. Let us delight you. Stay with us and experience our trendy town. Even when it was a school it was a good place to sleep... now that its The Hope and Glory Inn, it's a good place to wake up as well. This and other Irvington Bed and Breakfast Inns can be found here in The Register.